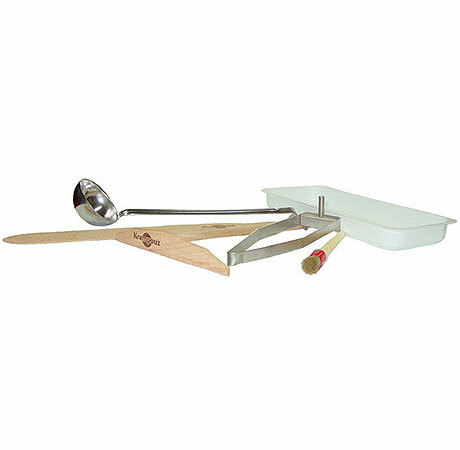 Commercial crepe spreading tools for use with cast iron crepe makers. Includes a stainless steel spreader, stainless ladle, beechwood spreader, beechwood spatula, plastic container, pastry brush, and a set of instructions for use. 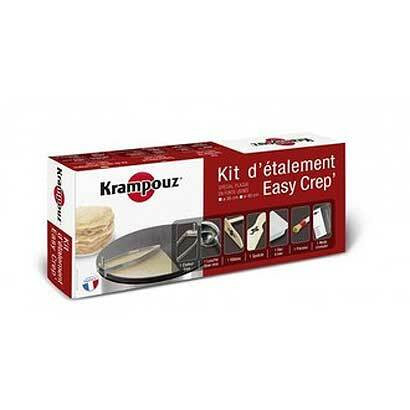 This kit is by Krampouz, the maker of crepe making cooktops. Stainless tools should only be used on commercial cast iron surfaces. Comes from France. This commercial quality toolkit for includes some quality accessories that are useful in the kitchen when cooking a variety of products in addition to crepes. The 2 x 12 inch spreader is the classic design that facilitates spreading out thin coatings of crepe batter in circular patterns. Metal spreader is 2 x 7 inches.